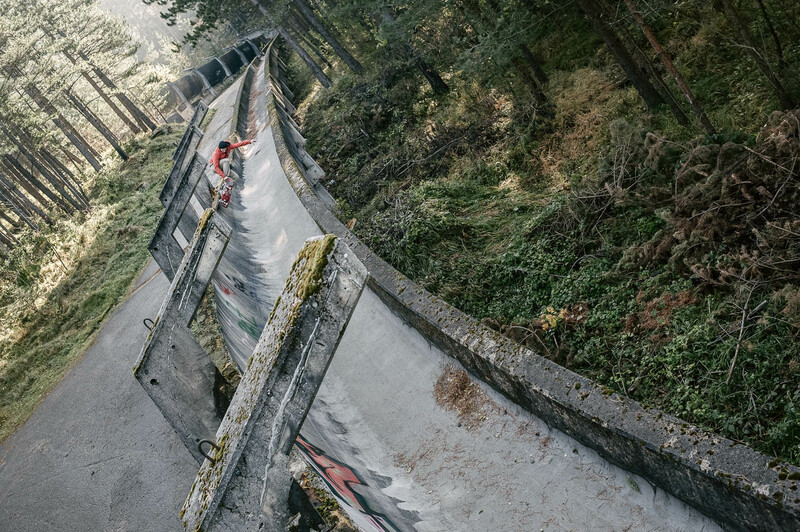 Gosha Konyshev, bs air on Sarajevo’s abandonned bobsled track. Photography by Alexex Lapin. Words by Kirill Korobkov. Originally we were supposed to start our first Balkans trip from Sarajevo. Pretty much exactly the same time two years ago we were on the way to Bosnia and Herzegovina when we got stopped during the connection in Belgrade, Serbia. They didn’t let us onto the airplane to Sarajevo because we missed the paper voucher that was supposed to be an original letter of confirmation from the hotel that had been sent by normal email with a signature and stamp. We couldn’t believe that only two years ago someone needed such an old type of document as a necessity to enter the country that was supposed to be visa free for us. I guess it was meant to be that way. We had an awesome time in Serbia that turned into true love for the whole Balkans region. For three years in a row now every November we go back to the southeastern Europe for the new countries, new and old friends, warm autumn days, cheap prices, good food and the best untouched spots of the continent. Here is our third Balkans tour with Gosha Konyshev, Yura Renov, Dima Rodionov, Dima Shatalov, Leo Lukin and Stas Provotorov. We went along the Western side from Bosnia and Herzegovina through Montenegro, Albania and Macedonia to Greece. This time we had along Russians only and the most photogenic spots out of all three Balkans trips combined. Sarajevo is a really interesting mix of different ages. The outskirts are full of big dark looking inhabited apartment houses, which is typical for all ex-Socialist countries. Most of them still have bullet marks from the war that happened in the beginning of the nineties right after that collapse of Yugoslavia. The city centre has beautiful architectural heritage from the Austro-Hungarian Empire. The old city has a Turkish or even Middle Eastern look with small wooden pavilions, shisha bars, mosques and chaotic narrow streets. There are a few modern skyscrapers here and there. Also all around the city you can find Olympic venues from the 1984 Winter Games that definitely saw better days in the past. Gosha, Konyshev drop in in Sarajevo. Mountains surround Sarajevo and because of that, the city is pretty compact. They don’t really have big plazas or open spaces but also it means that everything you need is really close. This city might not have the nicest infrastructure for skateboarding but you can easily cruise around. Skateboarding isn’t a big thing in Bosnia and Herzegovina, but the local skate community has been doing it for around ten years. The guys showed us their favourite food spots, introduced us to the nicest types of Rakia (fruit brandy popular in the Balkans) and gave some useful spot tips. 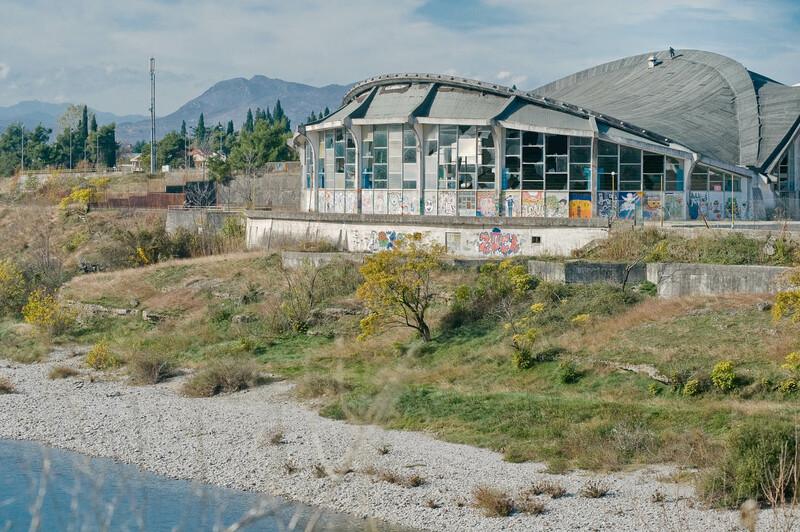 Old Olympic venues and Yugoslavian monuments are a must visit for all the skaters coming to Sarajevo. The brutal looking stadiums with grey walls made of raw concrete still have some serious skate potential. One of those buildings might have the best natural mini-ramp you can ever find on the roof. Another outstanding spot is abandoned bobsleigh track, which is basically a security free narrow half-pipe than goes downhill through the forest for 1300 metres. All the turns have over-vert transition and that’s like the best amusement park a skater can think of. It’s really hard to do a real trick on the track but the feeling of just riding down that thing is unbelievable. Sarajevo was a great starting point for our new Balkans adventure. It has everything we like about this region: sketchy taxi drivers, low prices, good vibes, interesting history to learn, fantastic spots and a bit of this venturesome feeling that most of the European countries tend to have lost the last couple decades. It is always fun to explore countries you don’t really know much about. It’s like going to university where your skateboard becomes your main guide. I feel stupid to talk about it but the only two things we could think of regarding Albania before going there were Eniz Fazilov and the Albanian mafia. Since Eniz wasn’t with us we focused on the Albanian mafia. I feel sorry for the Albanians, but the image this country receives in the media, movies and modern culture is really criminal. Also we had never seen any skate photos or footage from Albania so we didn’t really know what to expect or what it would be like to be there. We arrived to Tirana around noon hoping for the best, but preparing for the worst. I am going to disappoint you straight away. I got nothing crazy to tell you about our Albanian stay. The sketchiest thing that had happened to us was a giant ugly frog we saw in a public park on the first night. Tirana is a decent big city with typical ex-Socialist architecture. It reminded me some of the southern ex-Soviet cities in Central Asia or Caucasus. A few standing out details that I noticed were the record-breaking concentration of all types of old Mercedes Benz’s and the popularity of weightlifting among Albanian men. Pretty much every second car in Tirana is Mercedes Benz. And they watch weightlifting competitions every night on big screens like it is football or Formula One tournaments. Dima Shatalov, 360 flip in Tirana, Albania. One of the things you definitely can’t miss is a giant pyramid that was supposed to be mausoleum for long-term Albanian leader Enver Hoxha. After its completion it was turned into Hoxha’s museum and then later on it contained a nightclub. Then NATO had it as its base there during Kosovo War and now it is used as broadcasting centre by an Albanian TV channel. It is 28-metre tall surreal building with smooth banks from the bottom to the top, which everyone climbs these days. We hoped it would be an amazing spot, but unfortunately the only skate-able option we found possible was flip tricks on the very bottom of the banks that would look stupid on such a giant structure. Still it was cool just to see such a weird building in real life. 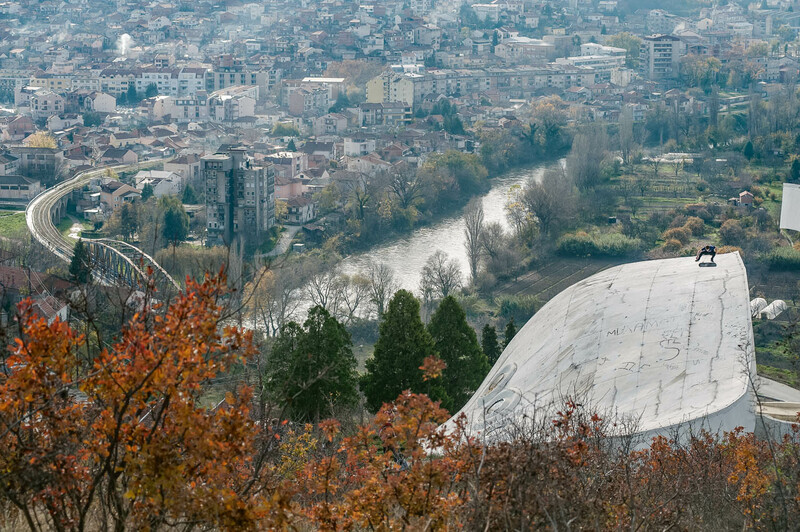 I hope Albanians will save it because despite the historical message it had this pyramid is just a really unique structure no other city has. By the way another crazy part of Enver Hoxha’s heritage is the bunkers all around the country. He believed that West would attack Albania and initiated the campaign of “bunkerisation” that resulted in the construction of 700,000 bunkers in every corner of the country. No war like this ever happened but you can still find most of those bunkers everywhere from the streets of the cities to fields, beaches and even in graveyards. We haven’t found a good one for skating but I am sure somewhere there should be few nice ones you can skate. Go for it and let us know. Ethnically people of Montenegro are close to Serbs. They are neighbours, the Montenegrin language is really similar to the Serbian language and Orthodox Christianity is the dominant form of religion for both countries. Also it was the last country out of Yugoslavia that parted with Serbia. Russia has always had special relations with Serbia and Montenegro due to our mutual cultural and ethnic roots so it felt a bit special for us to be there. Right across the river from where we stayed there was a big abandoned sports complex. Some parts of it had been turned into a fitness club and people were still working, but all the main stadiums were not in use. Most of the windows were broken, there was trash and wild grass all over the territory and old graffiti on the walls and everything inside was broken too. The roof of the stadium was the shape of giant ramp and Alexey wanted one of us to skate on the top of the building. Since I don’t have a chance to get a skate photo too often (more like once in couple years) the crew nominated me. It was way harder to climb up that roof than actually skate it. After Gosha and I did few drops we were done and tried to leave the spot. Some random guy who had been watching us for around ten minutes shouted at us when we hopped the fence. He asked us to stop and wait for the police to come. Kirill Korobkov, Roof Riding in Podgorica, Montenegro. We didn’t really pay attention to his words and skated away towards Alexey who shot the photo from the other side of the river. The whole condition of the stadium was so poor that in our opinion there was nothing to care about. Imagine our surprise when police pulled us over 15 minutes later in a different hood. Half of our crew got arrested but half of us ran away and hid in the hostel. Thankfully our hostess who didn’t tell the police that we were inside. We were sure that this would not go too serious. We messaged our boys in the police station and they told us to go to the next spot where they probably would join us. We all got a phone number of the Russian consulate in Podgorica and did what our comrades had told us to do. The next spot was actually a roof too. The sides of the building were banks and it was possible to jump off the roof into those banks. As soon as Yura Renov started trying to ollie security guards rushed in and arrested us too. It turned out that it was some kind of ministry or really important building where we couldn’t skate and film or even get up on the roof. They were super serious about it and there was no other solution than the police station. It didn’t come as a shock when they drove us to the same police department where our friends had been locked up for about an hour by that point. We couldn’t believe it went that far just because of skating some roofs with no damage. It was even stranger that the guy who called the police at the first spot was still there with some photos. We didn’t really know what to expect. Only a few hours later we found out that the guy was one of the sports complex managers and he tried to accuse us of all the destruction that had happened to the stadium in the last decade. He had probably got some money to fix it, stole the money and tried to prove to the police that we broke the brand new roof that actually hadn’t had any maintenance for years. Luckily for us the police weren’t corrupt and let us go in few hours. Right after we left the police station we decided that on this trip we should skate as many roofs as possible. Well that was our only full day in Podgorica and we spent most of it under the arrest in police. Things could’ve gone way worse though. We all were free after all; I got a photo on the roof and a good story to tell. We had nothing else to do but to celebrate another day of the trip. Tuesday night in Montenegro can be really fun. A couple guys we met by the bar gave us a proper party trip around their capital. The next afternoon the border guard recognised us. He already knew that there were skaters who had gotten arrested for skateboarding on the roofs. This is how fast news about us spread around Montenegro. After two previous visits to Macedonia we felt like it became our little home base at the Balkans. We got really got good friends over there. Every time we stay at the same Shanti hostel and we know Skopje almost as good as it was our home city as we have our own favourite food spots and bars. Macedonia hasn’t changed much over last two years. It is still somewhere in between old Yugoslavia past and some kind of new identity that they are trying to find through their history. Gosha Konyshev, fs board in Veles, Macedonia. Since we had covered pretty much all spots in Skopje during the previous stays this time we decided to check out a new Macedonian city. Veles seemed to be the best option. It’s a small city in central Macedonia around 50 kilometres away from Skopje. We saw some great looking spots from Veles on Facebook and decided to give it a try. It was absolutely right choice not only because we got a few more photos for the article but also we skated two more roof spots and successfully escaped from the police. The same night we talked about all the places we skated this trip and honestly the line-up of spots we skated was off the hook. It wasn’t just about roofs or anything particular, but just the general view of those buildings, structures and constructions. I hope the photos for this article speak for themselves. Some trips you have one or two spots like that for the whole journey and the photographer gets lucky, but here we had all that epicness in every city. I strongly believe that skate-wise the Balkans is one of the most underrated regions on our continent and our trips are the best proof of this. Dima Shatalov, fs flip in Veles, Macedonia. We finished our tour in Thessaloniki, Greece. We didn’t really plan it that way but it was just easier to fly out of Greece than out of Macedonia. Most of us spent in Greece around three hours and that was right about the time for me to ruin my dream about the proper Greek salad. Instead of a real version of the world famous salad I got something that reminded me of salad bars at gas stations by the highway in the middle of nowhere. With disappointment in my stomach and satisfaction about the whole adventure we headed to the airport. 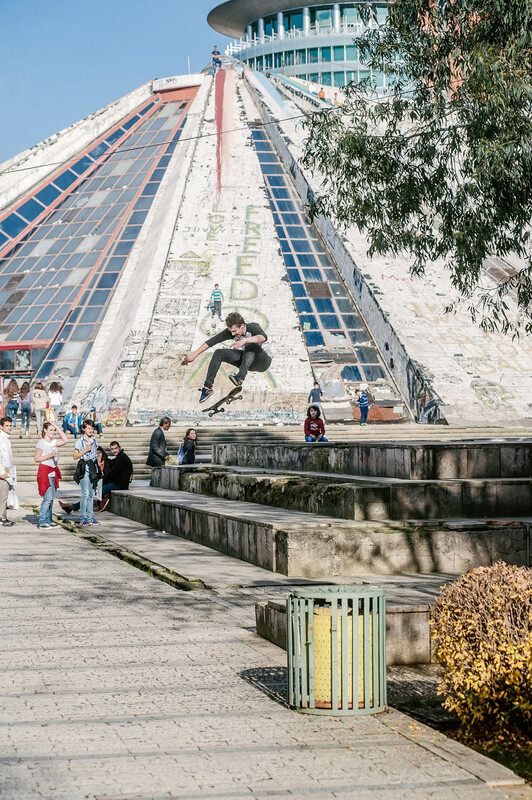 Alexey Lapin, Yura Renov and our filmer Pasha Kryukov stayed in Thessaloniki a few more days and even got couple flicks that will probably make it into this article too. They enjoyed all great Greek food and drinks we didn’t have and got inspired by the local hospitality. No surprise they started talking about a big Greek trip for next November as soon as they came back home. Should we go to Greece this autumn or keep it to the Balkans one more time? I would say Balkans again. We got two more countries we haven’t skated yet!